Test Shot Clip: We wanted to show Nikki's joy and natural screen presence. We also wanted to show her willingness to be quirky on request. She has had parts in our past projects and is one of our most versatile spokes models and actress. vip spokesmodel - Nikki from VIP on Vimeo. i48/2009 Winner: "Beneath The Western Sky Scraper"
i48/2009 Winner: Under The Western Skyscraper from VIP on Vimeo. VIP was honored to be invited to participate as part of Team Sidewayz in the 2009 i48 Film Festival and Competition. We were awarded Best of Film and one of our leads, Eric D. Ellis took home the Best Actor Award. It was a challenge to be sure, but if only all production was this fast and easy in retrospect. We were loath to waste some of the beautiful footage that couldn't be fit into the 6 minute submission parameters so we cajoled, threatened, and bribed Ronn with food to get him to cut an extended version. You know that classic movie moment when a bunch of kids are in a foot race or soldiers are running to safety and someone falls? You know the heart tweaking moment when someone in front notices a fallen comrade (or competitor) and goes back to help them up and they go on together? If you combine that feel good moment with the urgency of a treasure hunt and the "no sleep, 25 hours of pushing it to the limit" driving force of military boot camp you might begin to imagine what it is like to be a part of the i48 Film Festiaval. As the owner of a small local production company here in Boise, I am very aware of costs and limitations. The smallest well thought out production must take into consideration costs for equipment and prop rental, location fees and scheduling, feeding and paying actors and and writers, etc. For i48 their is only one limitation - time. You have exactly 48 hours to script, shoot and produce a 6 minute film (you have no idea what your genre is until you are handed your assignment). I say that this is the ONLY limitation because this was my first year as part of an i48 production team and I now have first hand experience. Everyone on our team, Sidewayz Films, was there to give 150% because they wanted to be a part of the experience, vision and hope. No one was paid, no one was elevated by resume or accomplishments, no one was promised a future of luxury in films or production. We all, to a person, just wanted to be a part of something bigger than our individual lives; we were not disappointed. From the get go, we slammed it into high gear and didn't stop until the gas ran out and we came coasting, spent and worn, across the finish line. It was demanding, it was frustrating, it was challenging; but that was not the most memorable part for me. The thing I will remember most about my i48 experience is this: In the Treasure Valley we live in abundance. We have abundant joy, abundant resources, abundant beauty, friendship, hope, trust, companionship, goodwill.... we have abundant abundance! I know I am gushing, but when you do something for a living day in and day out and deal with the industry ups and downs, client and vendor issues, logistics and money, one might tend to become jaded; perhaps resentful of ones choice of career, location, luck and history. Out of necessity and need for expediency, these things are set aside, at least for 48 hours while one becomes clear and focused on the goal: do your best for and give your all to the team; not just your team - the i48 team, the Treasure Valley community team, the 'everyone that might ever watch any of these films' team. Locations, props, wardrobe, extras and equipment was secured with phone calls, text messages, facebook, email, and good ol' fashion on the spot asking. These are things I must obtain at some cost and then sell at a profit during my daily work week but for 48 hours, the abundance of the Treasure Valley was free for the asking. We asked for a lot and were given much more. We were given the opportunity to be, not just great, but grateful. 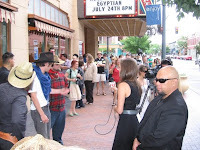 I was in a state of sublime gratitude from the minute I was invited to join Team Sidewayz (last years winner - Best of Films) through asking for wardrobe from The Costume Shop to filming in business locations during business hours to being rooted on by crowds gathering to watch us film. It's too much to list every gratifying event that happened in every gratifying minute but suffice to say, I saw my friends, my neighbors and my entire community in a brand new light, actually a new glow of beauty and abundance. All thanks to a little local film festival and competition: i48.